Lowriders is Hollywood's latest attempt at depicting the culture that's formed around customized classic cars in the Chicanx community. Although the film, directed by Ricardo de Montreuil, hasn't come out in El Paso yet, local lowrider and Chicano activist Hector Gonzales swears he's already seen it. "Every lowrider movie is the same—whether it takes place in the 50s, 60s, 70s, or the 2000s," he tells me. "The lowriders are poor, there's some neighborhood issues, some gangs, a brother goes to prison, mom and dad love him and try to help him out... And then they play handball in prison." While Lowriders does manage to break a few persistent stereotypes about Mexican American youth (a quality that hits home for Chicanos like me who know more about At the Drive-In than how to make cars bounce), it still sticks pretty closely to Hector's script—minus the prison handball. The movie follows Danny (Gabriel Chavarria), a young Mexican American who is far more interested in becoming a renown street artist than working in the garage owned by his dad, Miguel (Demián Bichir), a lowrider aficionado. Danny's mom, Gloria (Eva Longoria), tries to hold the family together, before Danny's estranged brother Francisco "Ghost" Alvarez (Theo Rossi) returns home from prison forces Danny to confront his family's turbulent past. And while it feels a bit redundant to see yet another film about Mexican Americans getting shot and going to jail, my biggest gripe with Lowriders isn't that it sits in the shadow of American Me. Instead, it's the way it leaves out lowrider culture's history and radical politics. I grew up on the border, where lowriders have always been a loud symbol of cultural pride, cruising up against an Anglo world that demanded orderly labor, model minorities, and obedient barrios. Most old-school lowriders and Chicanx historians trace the history of the lowrider to the the rise of the pachuco. These cholo forerunners wore flashy oversized ensembles called zoot suits, spoke a distinct border Spanglish, and connected with jazz and street culture. In the 1930s, the pachuco style was immortalized when the Juárez-based performer Germán Valdés harnessed the pachuco dialect and clothes in his infamous caricature Tin-Tan, spreading the pachuco look across the North American continent. Pachucos subversive aesthetic became notorious, enraging establishment types on both sides of the border. Most importantly, pachuco represented nonconformity and rebelliousness at the peak of Anglo nationalism in the 1940s. Back then, Mexican American communities were still recovering from the US government's 1930s "repatriation" program, which saw the mass deportation of a million Mexicans and US citizens of Mexican-descent "back" to Mexico. Meanwhile, Mexicans continued to face the day-to-day racism of an Anglo society that saw them as aliens. The appearance of young brown men and women wearing zoot suits only contributed to the rising wrath of xenophobia, which eventually blew up in 1943 with media-sanctioned assaults on Mexican American communities during LA's Zoot Suit Riots. Still, when the United States entered WWII, as many as 500,000 Mexican Americans enlisted. As Chicana historian Dr. Yolanda Leyva argues, much of this had to do with proving loyalty and demanding inclusion. "In WWII," says Leyva, "we fought in bigger numbers, and a lot of it had to do with proving patriotism. So when the troops came back, there were heightened expectations for equality and the end of racial inferiority." Unfortunately, Mexican American veterans came back to the same segregated, white dominated society as when they left. A younger generation of Mexican Americans weren't having it. Confronted with persistent inequality, some young Chicanxs turned to their cars as a means of finding their own way. Gabriel Gaytan, an El Paso Chicano muralist and admirer of lowriders, explained that some of this had to do with flipping white approaches to the automobile. "The white man," says Gaytan, "he went into hot rods and fast cars. They would raise their cars and get these big ole motors, these big trucks… but the Raza says, 'Nah, I want to do the opposite. I want to do it nice and slow. Slow and low.'" To get the car low, early lowriders weighed their cars down with cinderblocks and sandbags, and then took their cars on slow barrio cruises, a practice that mimicked the courtship-seeking paseo of young men in Mexican pueblos. 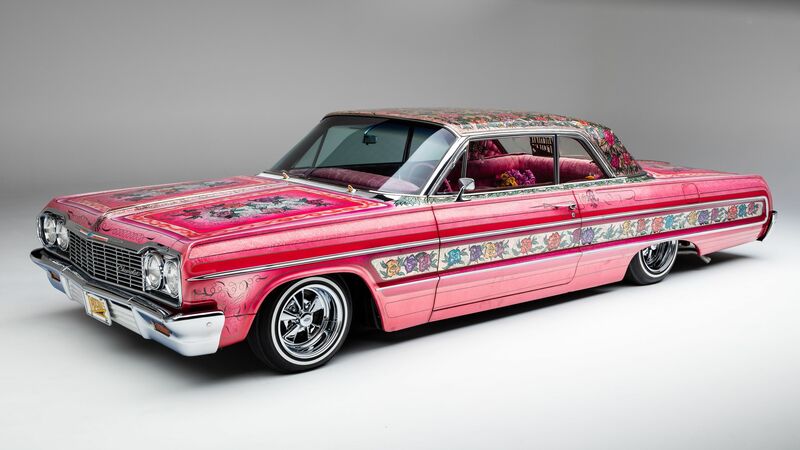 The lowrider also pushed against typical American car design, showcasing Mexican American religious imagery, candy-colored vibrancy, and handcrafted representations of Nahua and Maya symbolism. It's this imagery that inspires most lowriders to think of their cars as "rolling art." The lowrider's imagery and history has also enabled it to stand for much more than a flashy vehicle at a car show. For some, the lowrider has come to define the ambition of cultural preservation and barrio defense in precarious times. Today, gentrification and urban displacement are among the biggest challenges confronting Mexican American communities. From Chicago to Los Angeles, Mexican American communities are feeling the stress and trauma of haphazard "development plans" and transplant wanderlust. But in El Paso, lowriders have played an important role in resisting the trends that threaten Chicanx spaces. Hector Gonzales is one such lowrider. He first got into lowriders in the 1970s, with the publication of Lowrider magazine and the emergence of Gypsy Rose in the sitcom Chico and the Man. When he was 14, he built his first lowrider bicycle and then went on to co-found the Latin Pride car club in El Paso. But as he grew with the scene, he quickly realized that lowriders were more than cars. "We're not just about lowriders," says Gonzales. "We're about the people. When you write the word 'lowrider,' everyone thinks of the car. It's not the car—it's the guy, the family, the people, la cultura." Gonzales and other lowriders have therefore harnessed their lifestyle to contribute to anti-gentrification and cultural preservation movements in South El Paso. In the mid 2000s, development plans to "revitalize downtown" attempted to tear down vast stretches of South El Paso and Segundo Barrio, one of the oldest Mexican neighborhoods in the United States. Some lowriders informally participated in protests against these proposed demolitions, but the city finally crossed the line when development plans aimed to destroy Lincoln Center—a Chicano cultural center where lowriders had been meeting for years to host car shows. Hector and other car clubs quickly assembled to stop the demolition. "That center is very important to the Chicano community and everything we stand for," Gonzales says. "The city wanted to tear it down, so we showed up to fight and save it. When the city came with the bulldozers, we had people holding hands creating a human chain. That's the way the lowrider community does it—by numbers." After a nine-day encampment led by local activists and car clubs, the city finally backed away from the plan. But lowriders are committed to fighting new encroachments on barrios in South El Paso—specifically the latest development plans to build an arena in Duranguito, another historic Mexican community. "Years after Lincoln Center, they want to tear down another barrio, and we're there with them 100 percent," says Gonzales. "You see in these movements, the lowrider brings in la cultura, la musica, la fiesta, and then it turns it all into a big party in the end." Leyva, who's working to try to preserve Duranguito, agrees with Gonzales's assessment. "If a place is threatened, you have to occupy it—not just with your body but with art, with culture. When lowriders cruise a neighborhood, they help occupy and claim a space culturally, which is very political." Yet not every lowrider is interested in explicit activism. Mando Espinosa and Mando Santillán with EPTCruising have both brought their sizable car clubs in to help with barrio-preservation efforts, but politics isn't their main pursuit. "Politics is one thing, lowriders is another," says Espinosa, "There's nothing wrong with people having their own issues, but the lifestyle and the culture of lowriding is different. If you can mix both of them, OK, but we're more about the lifestyle of lowriding." If one thing is clear, though, its that the culture of lowriders is ultimately radical in American society. Even if some lowriders aren't interested in explicit politic action, their commitment to maintain a tradition with such a dynamic Chicanx history is an act of cultural preservation in itself. Lowriders hits theaters May 12.